From an economic perspective, too much government spending is harmful to economic performance because politicians and bureaucrats don’t have very good incentives to spend money wisely. More specifically, labor and capital will be misallocated because people in government generally are guided by political motivations. By contrast, there’s a bottom-line incentive in the private sector to use resources wisely. This generates the most prosperity for society because the only way to earn income in a free market is to produce goods and services that other people value. That’s sort of a macro perspective. From a micro perspective, when government allocates money, you can only make yourself better off by taking from others. In a market economy, you make yourself better off by serving others. 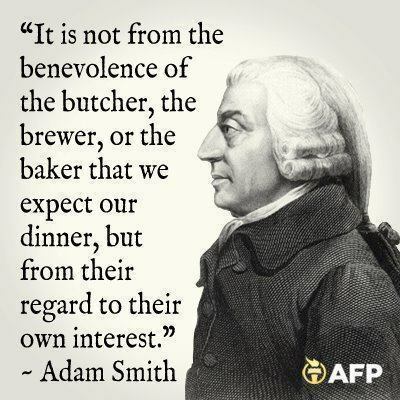 In other words,enlightened self interest (you can even call it “greed” if you prefer) is channeled productively in a free market system, as Adam Smith observed several hundred years ago. Now let’s look at a visual perspective, as illustrated by this image I saw on Reddit‘s libertarian page. Whoever put this together was quite clever to highlight the fact that people in the private sector generally buy in the top-left quadrant while people in government generally buy in the bottom-right quadrant. And if you want to see the late Milton Friedman discuss this concept, here’s a video for your viewing pleasure. I’ll simply add a few observations. One of the reasons I often compare market-oriented nations and government-oriented nations is to highlight how countries are more likely to become prosperous when most resources are allocated by private decisions rather than political decisions. In other words, South Korea out-performs North Korea because its economy is largely driven by decisions in quadrant 1. Just like Chile out-performs Argentina and Argentina out-performs Venezuela for the same reason. P.S. This video on profit, narrated by Walter Williams, is a good addition to the insight of Smith and Friedman. Milton Friedman’s series FREE TO CHOOSE can be found on You Tube. I had the opportunity to correspond with him and I was impressed how promptly he wrote back. What a great man!!! @Denver that’s because that is not a question. It’s a red herring used to rationalize further government attempts to circumvent the laws of economics without having to justify the centuries of failure by government to successfully subvert the laws of economics, each of which has resulted in immeasurable pain, suffering and death for those who are underneath the attempting government. Your question is just BS rationalization, “well this time it’s different.” It’s not. There will always be unlimited demand, and therefore an opportunity for individuals to create wealth by meeting others’ needs. Until AI and robotics reach a level where they can meet every human need without assistance, iow, the Star Trek level, there will not be a systemic shortage of jobs, even if the notion of the 40 hour week changes to the 10 hour week. All human organization can be placed on a line between Monopoly and Free Markets. The Government Monopoly like all Monopolies suffers from the same disease, the lack of the “Feedback of Competition”. It is the “Feedback of Competition” that provides both the Information and Motivation which forces continuous improvements in Quality, Service, and Price in free markets. Governments do not always spend in Quadrant 4. They only spend in quadrant 4 when spending for average citizens – you know, the serfs who think civil servants work for them, but in reality exist to feed the government beast. 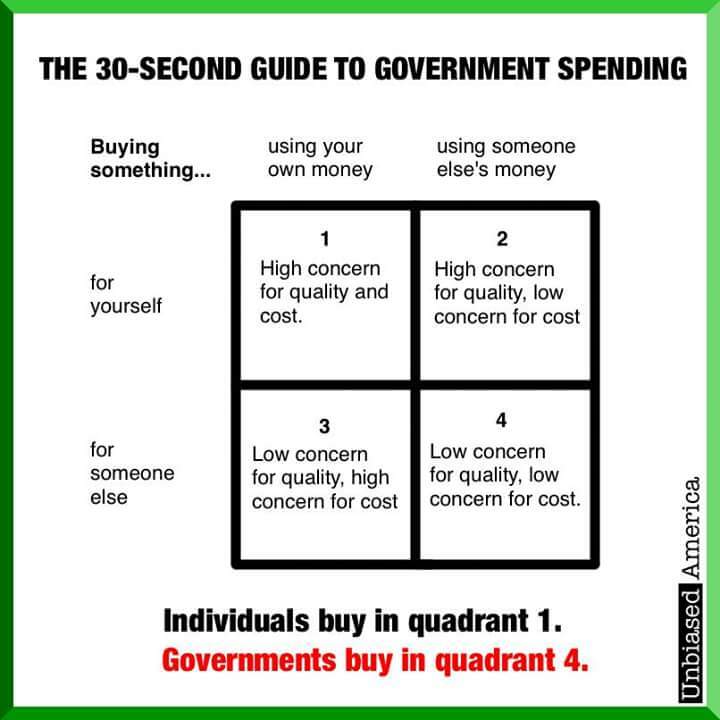 When governments spend money on themselves it is always in Quadrant 2. Ever see a shabby capital building, whether in a state or national government. The question on no one’s mind appears to be “what happen when all/most/at lot of the jobs are being done by AI/Robotics and 60% are unemployed because of lack of JOBS? Adam Smith, Milton Friedman and Karl Marx become absolutely meaningless when labor losses all of it value. In the email, that is. The link for the Milton Friedman video is missing. I believe Friedman also used a version of that image, worded slightly differently but containing the same content, in his 1980 book Free To Choose. Recently, some group put up ads here in Australia, to advise our government that Australia is not a heavily-taxed nation, so the Prime Minister should not be thinking of lowering any taxes! We are now having a General Election, so nobody will be talking about raising taxes, except on that favourite scape-goat, the ‘rich’. Still, the ‘taxes-are-good’ mentality is just waiting for the wrong moment! Even if politicians did have the structural incentives and massive parallelism intuition to spend money wisely (as free markets and free people tend to do) … People from whom a significant proportion of vitality is confiscated to serve distant unknowns (coercive collectivism) — are partially slaves — and are thus less motivated — are out competed by others worldwide — and their growth rates are dismal as evidenced by virtually all welfare states worldwide. And growing at half the average structural world growth rate leads to rapid decline. Things ultimately correct themselves. But they consume entire lifetimes of lower standards of living, even outright misery, in the process. Don’t get caught in it. If you think people in government can use the money of people they don’t llnow to meet the needs of other people they don’t know, ask yourself one question. When was the last time I bought my spouse, the person I know the best and love the most, the right birthday present?